Wisconsin is renowned for it’s cheese, and most people know that the best way to enjoy some Wisconsin cheese is with a great glass of wine! 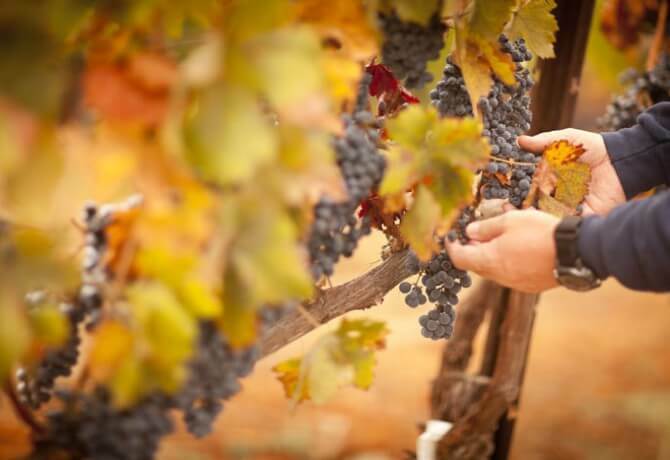 One of the most crucial steps in wine making is the harvesting of grapes; the ideal time for Wisconsin wineries to harvest grapes is between August and October. There are over 51 wineries in Wisconsin which cover almost 800 acres! Four of those wineries can be found in and around the Wisconsin Dells area. The Dells area wineries are known for their frequent use of cold-hardy varieties of grapes. Fruit wines made from other fruits such as blackberries and raspberries are also common in Wisconsin wineries. These wineries often hold annual events that combine wine tasting with entertainment and other recreational activities, all worth checking out if you are planning a relaxing vacation to Wisconsin Dells. Fawn Creek Winery is located about 10 miles north of Wisconsin Dells. Siblings Pam Genrich, Dan Hanson, Sally Haberkorn and Susan Spath founded Fawn Creek Winery in 2011 when they took over the operations of Tourdot Winery in 2011. This winery has a seven-acre vineyard in a grove of oak, maple and pine trees. The fall activities for this winery include the Black Bear-y Release Party on Sept. 29, 2012. This wine-tasting event presents the fall and winter seasonal wines before they are available to the public. The featured wine will be Black Bear-y, a Merlot flavored with blackberries. The 2nd Annual Fall Fest at Fawn Creek Winery on Oct. 6 – 7, 2012 also provides a tasting of seasonal wines. Additional activities include craft shows and hay rides. Von Klaus Winery is located in downtown Baraboo, the county seat of Sauk County. Clint and Clinton Clingerman are a father and son team at this winery, and have been making wine since 1999. They combine modern technology in winemaking with old world traditions, and do not add sulfites to any of their wines. This winery offers complimentary wine tasting services throughout the year at private events such as wedding receptions, anniversaries, retirement parties and corporate events. It also provides a four-course pairing of wine and food for two people. Weggy Winery is located in Muscoda, between Grant and Iowa counties. The vineyard covers about 16 acres, making it one of the largest in Wisconsin. This winery uses cold-hardy varieties of grapes such as Edelweiss, Espirit, Kay Gray, St. Croix and St. Pepin. Weggy Winery also grows other fruits such as apples, blueberries, sweet cherries, currants and raspberries. The biggest event at the Weggy Winery during the fall of 2012 is the 4th annual Rockin’ Grape Stomp. It will be held on Sept.29, 2012 and features a grape stomping contest. The Rockin’ Grape Stomp will also have live music and refreshments. Wollersheim Winery is located in Prairie du Sac, which is in Sauk County. Philippe Coquard is this winery’s chief winemaker, and also operates the business along with his family. The light-bodied wines at this winery include Eagle White, Prairie Blush, Prairie Sunburst Red and Ice Wine. The medium-bodied wines made at Wollersheim Winery include Domaine du Sac and Ruby Nouveau. Domaine Reserve is the primary full-bodied wine made at this winery. The Ice Wine Release will be held at Wollersheim Winery on Oct. 10. This event celebrates the release of the 2011 Ice Wine. Visitors will have the opportunity to tour the vineyards where the grapes are allowed to freeze solid before being made into wine. Live harp music and cheesecake will also be available for purchase at the Ice Wine Release.